My husband Barry and I love visiting different parts of Mexico, our second home. Every year we explore a different region…and we always search out that area’s pueblos magicos (magic towns). Pueblos Magicos is a government program to promote tourism in towns that offer natural beauty, cultural richness, archeology, folklore, history, cuisine, and the arts. A great thing about it is that even after towns earn “magic” status, they have to keep up those standards, or else that status will be removed. It means that when you go somewhere that’s currently listed as a pueblo magico, you just know that it really is going to be magic. Barry and I have the goal of visiting every one of these towns. No small goal! So far, we’ve been to 37 out of 111…so we have a way to go, especially as the list keeps growing. No matter where you find yourself in Mexico, there’s probably a pueblo magico near you. If you’re in Oaxaca, check out Mitla, home of the ruins with the same name. In the Yucatán, you can find Izamal near Merida, and Isla Mujeres, and Valladolid, which has its own cenote (a deep sinkhole, delicious for swimming on a hot day) right in town, near Cancún. 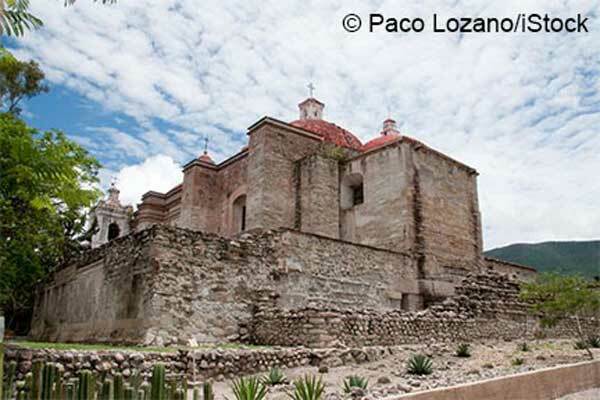 The ancient church in Mitla, near Oaxaca. 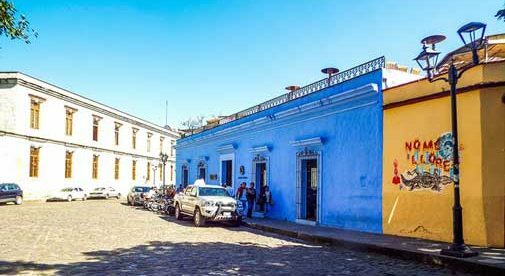 If you’re in Puerto Vallarta, you’re less than two hours away from tiny, little-known San Sebastian del Oeste, called one of the most authentic colonial towns in all of Latin America. Near San Miguel de Allende is Mineral de Pozos, the once-mining town turned artists’ haven. 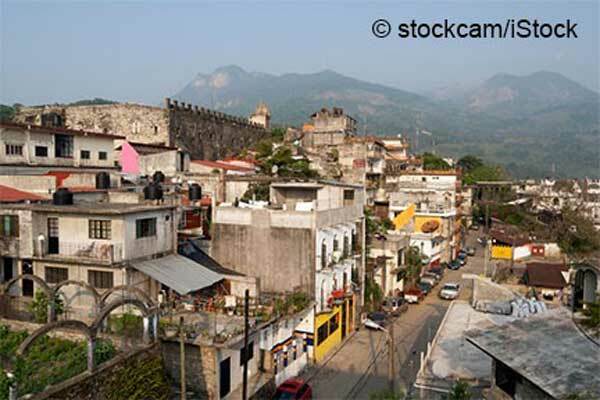 Many pueblos magicos are worth visiting even if they’re not that close. Xilitla, for example, is a good four hours from Queretaro by bus on a windy mountain road through the Sierra Gorda—but what a route! Along the way you can visit the Franciscan priest Junipero Serra’s elaborate, intricate missions, far more decorated than the missions he later built in California. Xilitla is also the home of Los Pozos, the whimsical garden park designed by the Englishman Edward James, filled with fanciful structures like curving steps disappearing into the clouds. The “magic town” of Xilitla. You can visit these towns by car, of course, but you can also take one of Mexico’s first-class buses. Leaning back on a reclining seat on Primera Plus or ADO, as I leisurely check my email with the bus’s free WiFi, I feel like I’m flying business class. Although Mexican first-class buses are affordable for all, they’re even cheaper if you have the government’s senior discount pass called INAPAM, available to permanent residents, where you save 50%. (Actually, as a person in her 60s, I’m usually given the 50% discount even without an INAPAM card. And with some bus companies, if you buy the ticket one day in advance, you also get the half-price discount). Describing these towns makes me greedy for more. Time to go! Join me?